Artist Chuck Gardner uses vintage barn wood to create one of a kind American flags. Rustic, distressed original art on vintage wood is my specialty. I grew up in the hills of Georgia, and after some higher education in San Diego, I now reside with my beautiful wife in the small town of Port Royal, South Carolina. I make my wooden flags in an art studio here in the Lowcountry, each one with careful attention to detail. I only use rock solid antique lumber, at least 100 years old. Most of my wood comes from the northeast United States, and is a mix of heavy oak, black walnut and hemlock, among others. Each flag is one of a kind and build to last, with multiple oil based coatings on both sides so they are suitable for indoor or outdoor display. I use heavy duty exterior decking screws to hold everything together, and heavy duty galvanized wire for hanging on the back. I make each flag before I list it for sale, so the flag you see is the exact flag you will get, although I am happy to take on custom orders for any type flag. The picture above is myself with the Governor of Georgia, Nathan Deal. 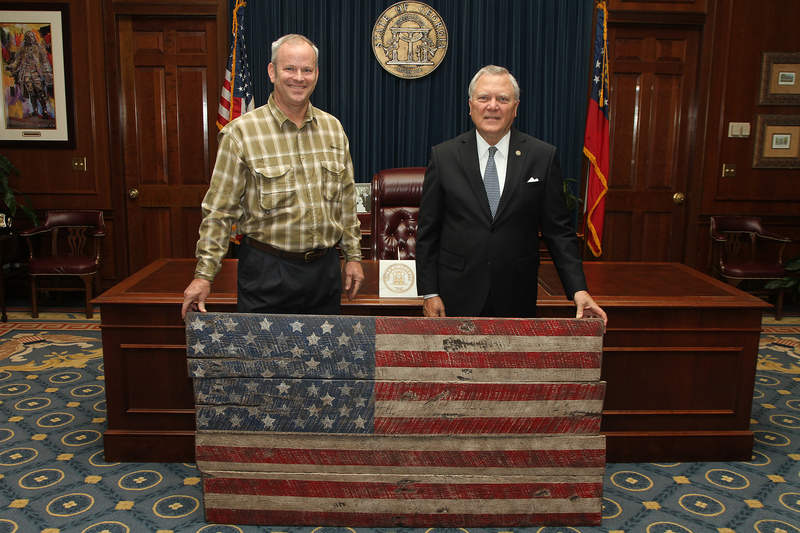 I was honored to have been selected to display one of my flags in the capitol building, and currently have a smaller version hanging in Governor Deal’s private office. I have refined my technique a bit since then, which you will notice when you visit my shop on ETSY. I have many of my flags hanging in commercial locations now including UNO’s Chicago Grill, Starbucks and several corporate locations around the globe. As a contractor in Georgia I learned many of the finishing techniques that I now use on the flags. Four layers of oil finish on top, and a thick clear coat on the back, really add to the fine art feel of my flags. After being subjected to the elements for 100 years or more, character is pretty much built into each board. I hand paint the flag onto the boards and then distress them, so you really have a nice mix of a rustic look, along with a high quality fine art finish on top. I keep track of how old, and where my wood comes from, so you can imagine where your flag has been before it ended up in your hands. Lots of history in these boards! I have made and sold more than 900 flags since I began my art career 10 years ago. The American flag has always been a big part of my life thanks to my father and his service to our country as a naval pilot. It has always been displayed proudly in our home. It is an honor for me to make them and I put lots of attention into each one. Thanks for visiting and make sure to check out my shop on ETSY to see what I am currently making. I also have more information about myself and my process there as well.